Casimir - Designing Synthetic Virus Particles for Gene Therapy (Publication in Nature Nanotechnology by Daniela Kraft and others). Designing Synthetic Virus Particles for Gene Therapy (Publication in Nature Nanotechnology by Daniela Kraft and others). Researchers from Wageningen UR, together with colleagues from the University of Leiden, Eindhoven University of Technology and Radboud University Nijmegen, have successfully developed an artificial virus. This virus can be used for the delivery of future generations of pharmaceuticals by 'packaging' them and delivering them to diseased cells. Dr. Daniela Kraft of Leiden University and prof. dr. ir. Paul van der Schoot (TU/e) were responsible for the theoretical underpinning that led to the design of the synthetic protein. The scientists present their findings in an article published in Nature Nanotechnology on August 24th 2014. Bringing large biomolecules such as DNA or RNA to a desired location poses a great challenge for new generations of pharmaceuticals. DNA for example cannot by itself enter cells, and is quickly degraded by enzymes. Natural viruses are highly effective in transferring DNA or RNA into cells. They do this by encapsulating and protecting their genetic material (RNA or DNA) with proteins. Natural viruses therefore bear great potential for therapies, but a health risk remains, and scientists are therefore looking for harmless alternatives. The inspiration for the research published in Nature Nanotechnology came from a theoretical model that describes the assembly of a natural virus, tobacco mosaic virus. Dr. Daniela Kraft of Leiden University and prof. dr. ir. Paul van der Schoot of TU Eindhoven recently developed this model together with prof. dr. Willem Kegel of Utrecht University. They investigated, how the natural virus achieves full protection of its genetic material. The crucial element for successful encapsulation is cooperativity, which ensures that the proteins help each other to bind to the genetic material. 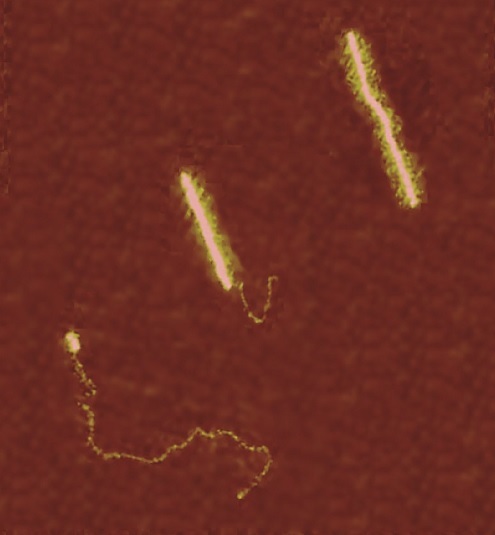 The design of the novel synthetic protein, which the scientists now presented, incorporates a similar cooperative domain based on silk. The synthetic protein consists of natural proteins such as collagen and spontaneously encapsulates DNA to form artificial viruses. Despite its simplicity, the synthetic virus resembles in many ways its natural counterpart. For example, its assembly dynamics can be described with the theoretical model that inspired the design, and the protein coat efficiently protects the DNA and transfers it to cells. The synthetic virus particles may be employed to bring new generations of medications such as DNA into diseased cells in a safe way, and thus be particularly useful for gene therapy. For more information on Daniela Kraft's research, please visit her lab webpage.